Did you know what your favorite paintings looked like when you flipped them around? Prepare to have your mind blown. Van Gogh’s “The Starry Night” is instantly recognizable from the front—but what about from behind? Not so easy! The enigmatic “Mona Lisa” might be the most singularly iconic image produced by Western culture, but you wouldn’t know that from looking at the back. 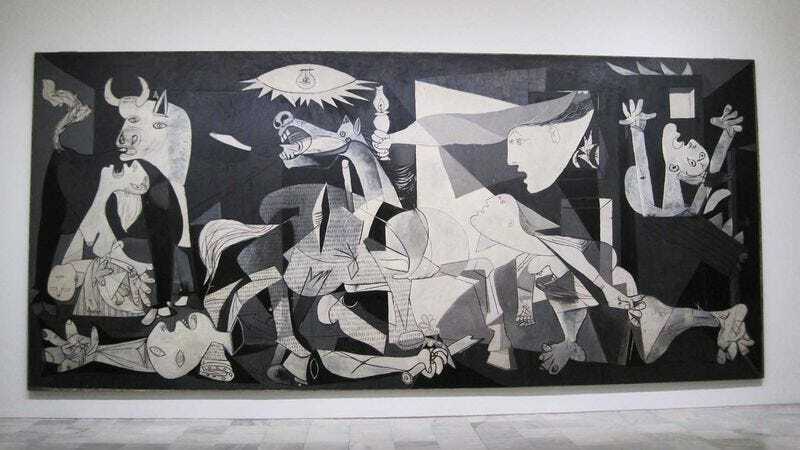 The front side of Picasso’s “Guernica” is a soul-wrenching response to the horrors of war. The back side, however, looks like he barely even touched it. Edvard Munch’s “The Scream” is one of the most famous paintings of all time—or is it? Totally unrecognizable if you happen to be standing behind it. “The Kiss,” or “Lovers,” by Gustav Klimt is valued at easily over $100 million, and judging from the front, at least, we could see why. Ever seen Rembrandt’s “Night Watch” in person? You might have and not realized it—Georges Seurat’s decision to paint “A Sunday Afternoon On The Island Of La Grande Jatte” on the back of Rembrandt’s chiaroscuro masterpiece has long frustrated museum curators unable to exhibit both paintings at the same time.